Cook pasta according to instructions on package. Fire up a 12-inch iron skillet (a stainless steel skillet will work too) to medium-high heat. Add olive oil. Place steak over hot grill and cook 3 to 4 minutes per side for medium rare doneness. Remove steak and set on a platter to rest. Season both sides of steak with salt and pepper to taste. If using a stainless steel skillet, add a splash of red wine to deglaze the skillet just prior to removing the steak. In the same skillet add mushrooms and cook over medium-high heat 3 to 4 minutes until mushrooms soften, stirring occasionally. If the skillet is too dry add a tablespoon of broth. Remove mushrooms from skillet with a slotted spoon. Add shallots and stir-fry for 1 to 2 minutes until they soften. Add the wine. Bring to a boil then simmer 3 to 4 minutes until wine is more than half evaporated. Add broth and half of the chopped parsley. Simmer another 2 to 3 minutes or until broth is reduced by half. Add back the mushrooms and stir in the butter. Season sauce with salt and pepper to taste. Plate your pasta. Slice the steak. 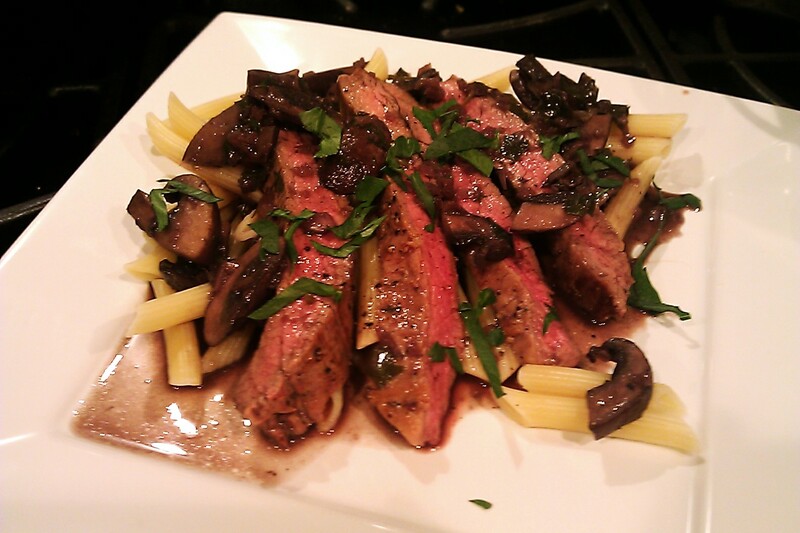 Serve steak on top of pasta and top with the mushroom sauce and sprinkled fresh parsley. Adapted from The Pampered Chef. Oh my goodness! This looks delicious! I think I’ll try making this next weekend! Yum! But I wonder, is there anything I could use instead of the red wine? Hi Briana. Great question. I have never substituted wine when a recipe calls for wine but you certainly can. Wine adds acidity and depth to a sauce and perhaps a touch of sweetness. For a “red wine” substitute may I suggest beef broth. To add a bit of acidity you may add a tablespoon of red wine vinegar per cup of broth or stock. For a “white wine” sauce, apple juice might work with some chicken stock or vegetable broth to add depth to your sauce. To add a sweet touch a teaspoon of honey should do. Hope this helps! What a fabulous-looking dish! That meat looks cooked to perfection!! Oh does that look appealing to me right now. You really cooked that steak to perfection. Thanks Diane. I noticed I was starting a collection of half-empty boxes and bags of dried pasta and figured this was good way to use up some of that left over pasta. I just went through the pantry too & found all the partial pasta’s. Of course every single one has a different cooking time so I just lined them up & every 2 minutes or so, emptied a different box in. I love steak with red wine reduction and mushrooms. It’s such a great pairing. Met too. Enjoyed every bite.